Thailand is an amazing place to visit. With its food, landscape and interesting cultural experiences, not to mention some nice beaches to relax on, it’s an intriguing place to explore. Full of curiosities, this is a country that blends cosmopolitan high rises with the farming community, fishing villages and Buddhist temples. How could a place like this fail to capture your attention? Then there’s the culture, which is wonderful to learn about and even better to experience. Of course, you have only one way to experience the country and that’s to head to the airport, board one of the many flights to Thailand and live it. The monarch of Thailand is a hugely important figure for the Thai people, and he’s a symbol of unity and national identity. There are images of the king throughout Thailand, in people's homes, on television and on all of the Thai money. One very important thing to note about this is that it’s a serious offence to show any disrespect for the king. The country's national anthem is played twice a day through loud speakers throughout the country. People usually stop what they’re doing and stand still for the duration of the song, and although tourists don't have to do this, to do so is a show of respect. Thailand is a predominantly Buddhist country, and in Buddhist tradition it’s important not to touch people on the head, as this is considered the highest point of the body. Footwear is usually removed when entering a temple or a home, but don’t point your feet at anyone (including an image of Buddha), as this is disrespectful. It’s also impolite to show immense emotion in public. Make sure that when entering a place of worship you’re dressed appropriately: in clean clothing that is not too revealing. The traditional Thai greeting is called the “wai,” and it involves putting your hands together in front of your chest as if you’re praying, and bowing your head a little. This is a nice way of showing respect. It’s even flexible — you can use it to say thank you or greet somebody. 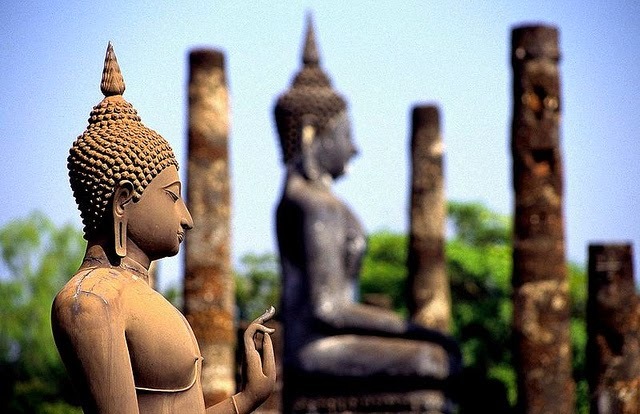 Thailand was known as Siam until the mid-20th century, and this is where Siamese cats originate. The original phrase for conjoined twins, 'Siamese twins' originated from two brothers from Siam — Chang and Eng — who were joined at the chest. Wow! Did you get all of that? Images by melanama, used under Creative Commons license. This post has been contributed by Thomson.